The Red-crowned Malimbe was formally described by Richard Bowdler Sharpe, an English zoologist and ornithologist who worked as curator of the bird collection at the British Museum of natural history. The Red-crowned Malimbe was collected by George Latimer Bates, an American naturalist. Bates visited West Africa in 1895, first to Gabon and later he moved to the south east Cameroon, making a living by farming. In 1905 he settled on the Ja River, calling his farm Bitjie or Bitye (after the Bulu pronunciation of his name). He collected many natural history specimens, especially birds, in his travels and sent many of these to the Natural History Museum in London. Bates collected a male near the River Ja, probably near his farm Bitye, together with Bates's Nightjar Caprimulgus batesi, and these were described as new species by Sharpe. Bates continued observing this malimbe and collecting more specimens. By collecting pairs at the nest, he realised that the females were all-black. By dissecting juveniles Bates realised that they all had an orange crown - females later moult the crown into black feathers. 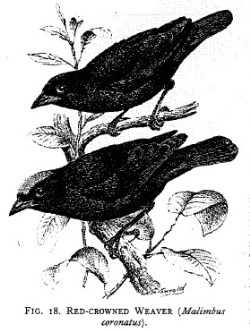 In 1928 Bates moved to England and wrote a Handbook on the Birds of West Africa (1930). 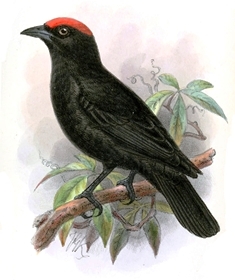 The Red-crowned Malimbe was first illustrated by Sharpe (1908), showing the male type. The next illustration to be published was a line drawing in Bannerman (1949), showing the male and female. Malimbus coronatus	Sharpe 1906a,	Bull. Br. Orn. Club 19 p.18,	River Ja, Cameroons. coronatus, Latin: coronatus, crowned (coronare, to crown). 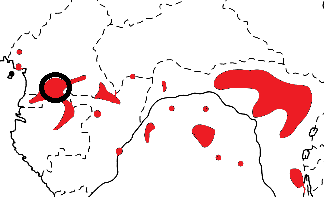 Red-crowned Malimbe (Sclater 1930a) and Orange-crowned Malimbus (Bates 1930a). Orange-crowned Malimbus, The Red-crowned Weaver. The type is in the Brisitsh Museum (BM 1908.5.25.100).